That collection does take one back to a rich past: Tennyson’s Lullaby. His poems are splendid. Magical words. Thank you Gallivanta. Recently I have been reminiscing with my mother about the fairy tales of Hans Christian Andersen. 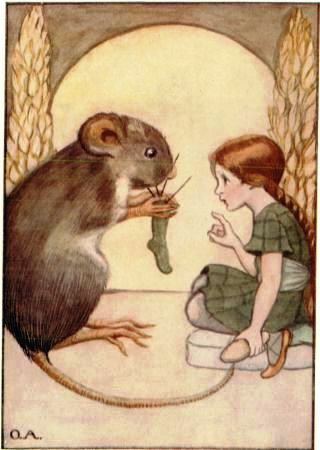 Thumbelina was one of the stories discussed. Fairy tales and fables are a rich heritage. I am pleased that these are being preserved. Universities now offer courses in myths and folklore. It is precious guidance to future teachers and students enrolled in religious studies and anthropology. I helped create this discipline, with the assistance of experts from all over the world. My area was animals, but it includes fairy tales: Beauty and the Beast, Puss in Boots, and Princes and princesses that are turned into toads. Dear Gallivanta, thank you for writing. I hope your health is better. I am doing very well, thank you, Micheline. Good news. You had been unwell. Reading this so early Monday morning makes me feel like going back to bed, the one I used to sleep on a long long time ago. thanks Micheline. I should have posted this short article, last night. Hope fills our early years. We can’t imagine anything will go amiss. When hope dies, it is as though one had been hit by a locomotive! I have a cat in whose little heart hope “springs eternal.” Yet his happiness depends on me. This is power I would prefer not to have. I love the illustration. It’s priceless.